Story: Does name of a particular recipe make a difference to the reader? I believe it does.. at least for first-time readers. The name and pictures of a recipe either prompt someone to look into the recipe or move on. When my friend told me about this recipe she didn't really have a name for it... so the name of today's recipe is totally made up: Shahi Kofta Hariyali.. the green gravy is the hariyali ... cashew nuts in the gravy and paneer in the kofta make it a Shahi (Royal) treat! Ashok's wife: "Pata hai - Pitaji pehle aapka naam Bahadur samjhe the aur Bahadur ka Ashok!" Ashok: "Kahin aisahi hota to tumhari shadi us gadhe (Bahadur) ke saath ho gayi hoti.."
Ashok's SIL: "Shadi koi Naam se thodi na hoti hai .. hoti to aap se hi! - jo bhi naam hota"
Ashok: "Jo bhi naam hota? Agar mera naam 'Chirkut-kumar' hota to bhi?" 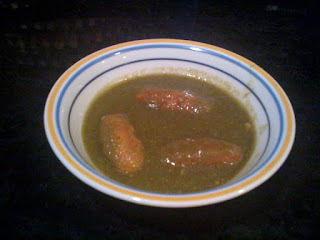 Oh by the way.. the flavor of green pepper dominates the taste of the gravy - and it is delicious! Mix the mashed potatoes with grated paneer, salt and pepper. Then add bread crumbs (about a cup) to get a dough like consistency. Add corn flour if the dough does not come together. Make round or any other shape koftas and keep them covered under a wet paper towel. Deep fry the koftas till they turn golden-brown in color. Blend the Green pepper, cilantro, green chili, ginger and garlic into a paste. Blend handful cashew nuts into a powder. Heat 1 tbsp oil in a pan. Add cumin seeds to the hot oil and once they start turning brown add the grated onion - grated onion gives a better consistency than chopped onion. Saute the onion till it becomes golden brown. Add the green paste and saute till the mixture starts losing oil.Add the cashew nut powder, garam masala and salt to this mixture and saute for a couple of minutes. Add hot water as needed (about a cup) to get to a liquid consistency for the gravy. Bring the gravy to a boil and then add the koftas. Another good thing about this recipe is that you can make the gravy and the koftas ahead of time and assemble them few minutes before serving. Angoor's version is even better than Shakespeare's (what's in a name). The recipe looks easy once all the ingredients are handy, will definitely give it a try some time.